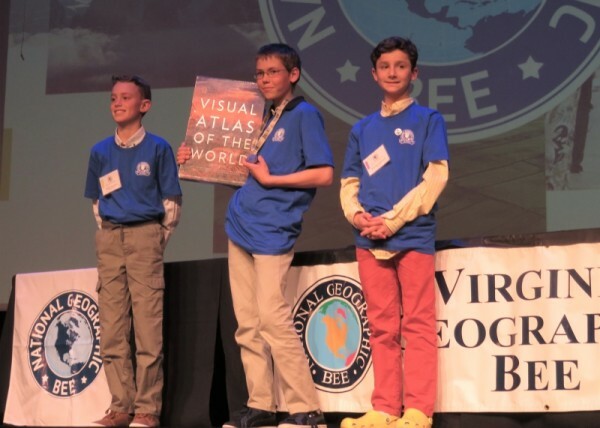 The 30th annual State Finals of the National Geographic Bee were held on April 6, 2018, at Longwood University in Farmville. 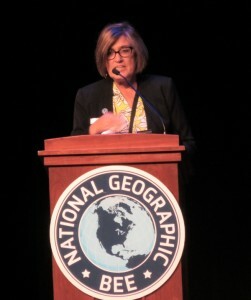 State Coordinator was once again Donna Fontaine, who finished out her tenure as state-wide coordinator with another well organized Bee. 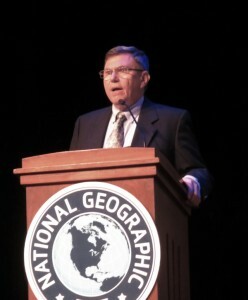 Dr. Don Zeigler, Professor Emeritus of Geography, ODU. This year 105 students participated: six fourth graders,19 fifth graders, 27 sixth graders, 22 seventh graders, and 31 eighth graders. Eleven girls and 94 boys comprised the contestants. As always there were 8 preliminary rounds, which resulted in 18 students with perfect scores. This number was reduced to 10 in a tiebreaker session. Those ten then competed in the final round to determine first, second, and third places. The winner of the Virginia State Finals was Caleb Hines of Ashburn Homeschoolers, Ashburn. He will compete in the National Championship at National Geographic Society Headquarters, Washington, D.C., May 20-23, 2018. Runner-up, in 2nd Place, was Nathan Dunaway from the Redeemer Classical School in Harrisonburg. Finishing in third place was Franklin Heyming of St. Bridget School Richmond. Left to right: Nathan Dunaway (2nd place), Caleb Hines (winner of state Bee), Franklin Heyming (3rd place). Congratulations Caleb and good luck at the nationals! Congratulations and thanks to all students who participated in the Geographic Bee across the Commonwealth and at the State Finals.